Chain Bridge at Newburyport, Merrimack River, Massachusetts, USA. This is the second bridge (1810) at this site, replacing a wooden bridge (1792). The 1810 bridge (rebuilt after a collapse in 1827) was itself replaced in 1909. 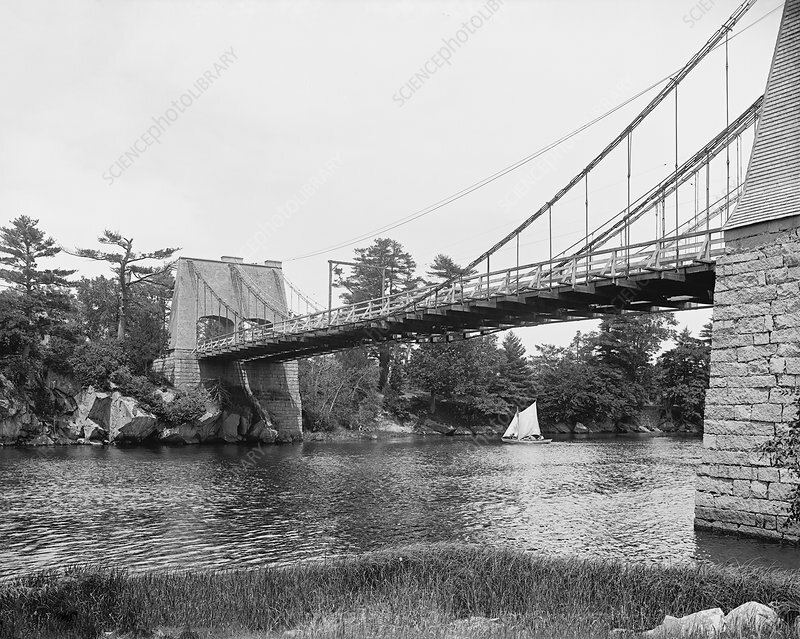 The 1810 bridge was the first suspension bridge in New England. The architect was John Templeman, based on designs by James Finley. Two timber towers (74 metres apart) rise from granite piers and support wrought-iron chains and two roadways (hence four sets of cables and two archways) on wooden beams. This photograph, from the Detroit Publishing Company, dates from around 1900.